Inspired by Savannah: Temporary Tattoos Make a Great Non-Candy Stocking Stuffer Filler -- Check Out These For Men, Women and Children from BetterLine! Temporary Tattoos Make a Great Non-Candy Stocking Stuffer Filler -- Check Out These For Men, Women and Children from BetterLine! Looking for a fun non-candy addition to your child's stocking this holiday season? How about picking up temporary tattoos from BetterLine. 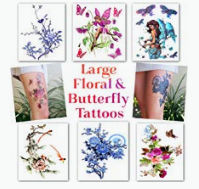 They offer a wide variety of temporary tattoos for men, women and children -- all with a 100% money back guarantee, if you are not satisfied with their product. 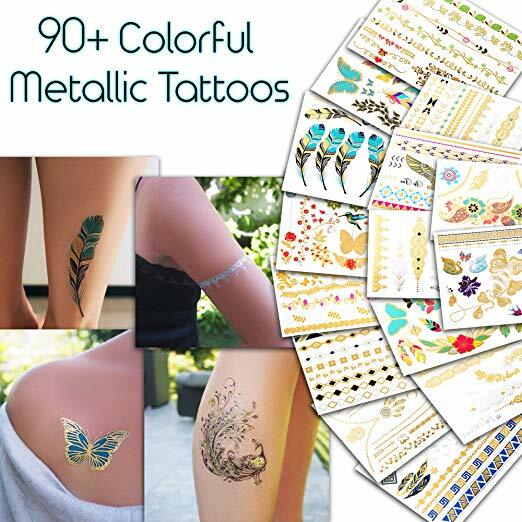 In a couple days I will be receiving their popular Metallic Temporary Tattoos for Women and Girls - Henna, Hamsa, Tribal, Elephants and Other Shiny Gold and Silver Tattoo Stickers for Body Art (90+ Metallic Tattoos - 15 Sheets) and one of their kid's tattoo sets to try out with my girls. I know my girls will be up for helping me review, as they love temporary tattoos. Next to stickers, they love temporary tattoos, and putting them on themselves. 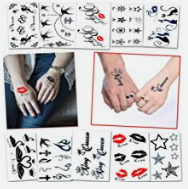 ★ EASY TO USE: It takes less than a minute to apply temporary tattoos anywhere on the body. Just cut out the design from the tattoo, peel off the clear plastic film, place the sheet on skin, dampen with wet cloth and wait a few seconds for it to dry. These tattoos typically last about three days and are waterproof. You can clean them with oil or scrubbing in the shower. 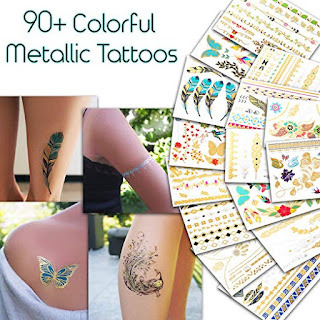 ★ ASSORTED DESIGNS: With many tattoos in each set, the BetterLine (NYC Fashion) temporary tattoos are great for birthday party favors, Halloween, costumes, bachelorette party favors, bridal showers, weddings, school events, carnivals, family fun, playtime, fashion style and more. 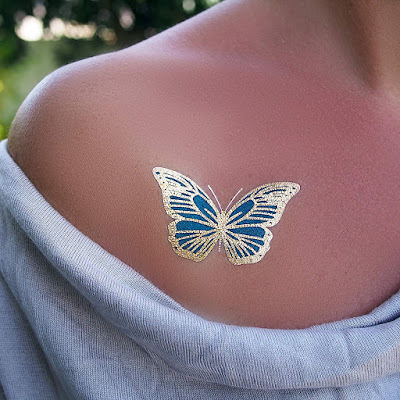 BetterLine's temporary tattoos start at $9.90 and go up to $13.90 in price, depending on style you choose. 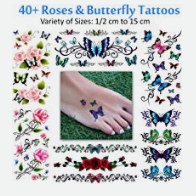 Check out some of the temporary tattoo packs you can buy now over at Amazon (all of which have a 5% off coupon code available to use, as of writing this post - so be sure you take advantage of this additional savings when you order). 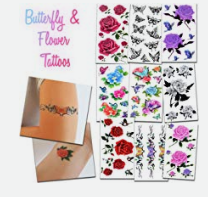 I am really loving the butterfly and flower tattoos from BetterLine, but also love their metallic set they will be sending us shortly for review. Be sure you check back for my personal thoughts and photos next week, after we have had a chance to try the samples out. In the meantime, though, I wanted to make sure you knew about BetterLine and their line of temporary tattoos for the whole family, at a great making -- making them a great stocking stuffer idea. 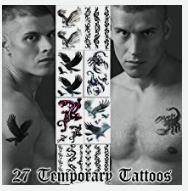 They would also make for a great Secret Santa or swap gift idea, as everyone loves temporary tattoos. 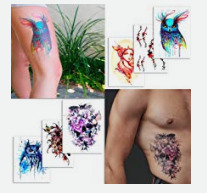 To learn more about the temporary tattoos available now from BetterLine, head on over to their Amazon storefront here: https://www.amazon.com/stores/page/606A63B9-CFB5-4CA6-B0C5-ACB5C3476FC1. And, remember to click on the save 5% coupon to save $$ with your order. Yesterday, we received a package from BetterLine and once I took all the tattoo packages out, and laid them out, I couldn't believe the wonderful selection of temporary tattoos we were sent. My girls were quick to grab up their favorite sheets -- my oldest went for the dog and cat ones, while my youngest was all about the fairies, princesses, Paris themed, and woodland creatures. Then, they ran to the bathroom to take turns applying the temporary tattoos all over themselves. Thankfully we didn't have anywhere to be, as by the end of their time in the bathroom, they were covered head to toe with tattoos. They even managed to get them on their cheeks on their face, and the backs. To say they liked these temporary tattoos is an understatement. 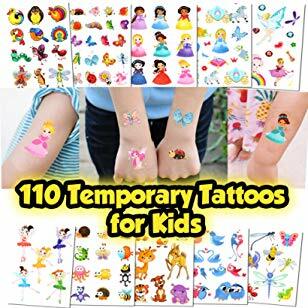 My daughters have a couple Christmas parties to attend next week and they are planning to bring some of the temporary tattoo sheets to hand out in place of candy, as they know they friends love tattoos just like they do. And, I know parents will love seeing these instead of candy when they go through their child's loot bags from all these holiday parties at school and at social meetups. 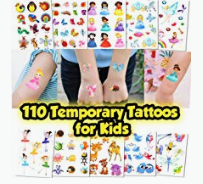 Why not consider ditching or limiting your child's holiday candy in their stockings this year and grab some of the fun temporary tattoo packages from BetterLine, available now from Amazon. Most packages average around $9.90, but you get so many tattoos, making them a great investment.